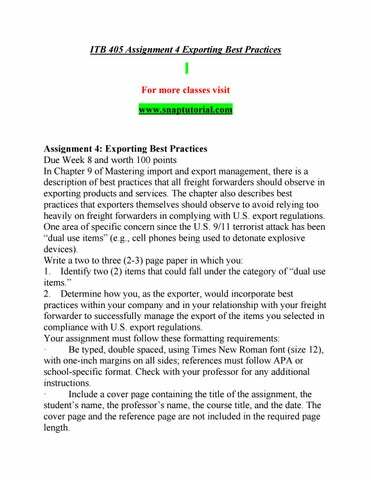 Assignment 4: Exporting Best Practices Due Week 8 and worth 100 points In Chapter 9 of Mastering import and export management, there is a description of best practices that all freight forwarders should observe in exporting products and services. The chapter also describes best practices that exporters themselves should observe to avoid relying too heavily on freight forwarders in complying with U.S. export regulations. One area of specific concern since the U.S. 9/11 terrorist attack has been “dual use items” (e.g., cell phones being used to detonate explosive devices). Write a two to three (2-3) page paper in which you: 1. Identify two (2) items that could fall under the category of “dual use items.” 2. Determine how you, as the exporter, would incorporate best practices within your company and in your relationship with your freight forwarder to successfully manage the export of the items you selected in compliance with U.S. export regulations. Your assignment must follow these formatting requirements: · Be typed, double spaced, using Times New Roman font (size 12), with one-inch margins on all sides; references must follow APA or school-specific format. Check with your professor for any additional instructions. · Include a cover page containing the title of the assignment, the student’s name, the professor’s name, the course title, and the date. The cover page and the reference page are not included in the required page length. Assignment 5: Export / Import Research Paper, Part 2 Due Week 10 and worth 200 points The second part of the research paper emphasizes your recommendations based upon your analysis of the country’s viability as an opportunity for export / import activities from the U.S. perspective from Assignment 1. Write a six to eight (6-8) page paper in which you: 1. Specify what cultural determinants about this country would be most important to you as you reach a decision about whether or not to do business in this country. 2. Specify what governmental, compliance management, and security requirements concerning this country would be most important to your decision. 3. Create action steps you would take to initiate export / import activities in this country. 4. Recommend the governmental and private assistance and resources you would choose to streamline the initiation of business in this country.